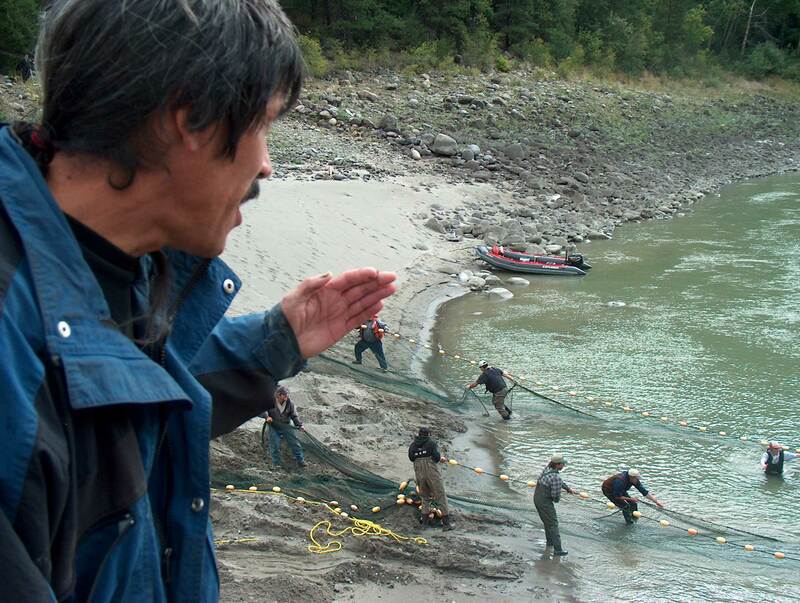 These are the fisheries of the Fraser First Nations. 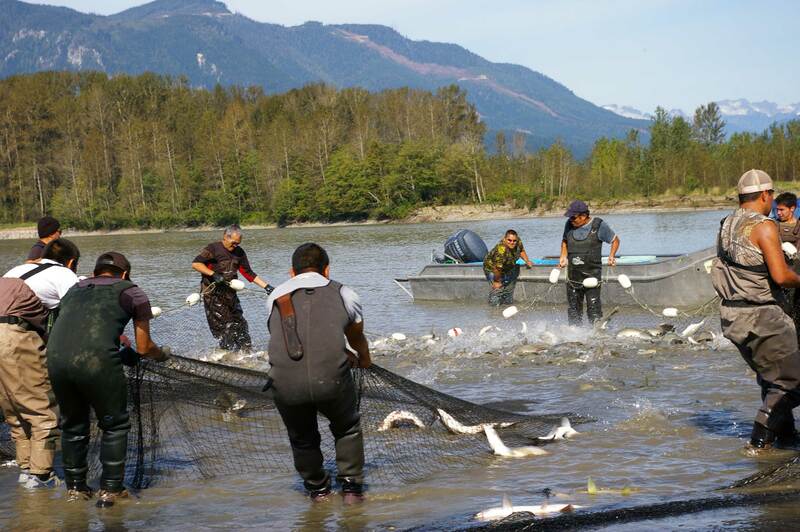 All five species of salmon are harvested each year by nearly 100 First Nations Communities belonging to at least nine distinct tribal nations living in and about the Fraser River. The Fraser Watershed spans over 220,0002 kilometers and runs through glaciers, deserts and rainforests. Harvesting technologies used are as diverse as the peoples, the environments, and the salmon stocks – angling, spear, gaff, and traps are common harvesting tools in shallower waters. Fish wheels and purse seines were introduced with modern machines, but the traditional dip-net is ubiquitous throughout the watershed, steeped in custom and arguably the most dangerous but most popular practice in this fishery. In some of the earliest documentation ever to record these fisheries, a 1910 memorial to then Prime Minister of Canada Sir Wilfred Laurier, the interior First Nations reflected a deep and iconic relationship between the Fraser salmon and their people since time immemorial – the most current evidence suggests this may precede the end of the last ice age. It is no surprise when one considers the vast supply of salmon for food and trade that made these nations rich, their peoples diverse, and the Fraser a navigation corridor of great ecological and economic value. Today these salmon support subsistence, sport and commercial harvesting. The fisheries span the river’s entire 1,375 kilometers – from its headwaters east of Mount Robson, downstream to the Fraser River Delta, debunking the myth that these fish are no good to eat once they leave salt water. Look for a wide variety of products, colors, flavors and textures in Fraser salmon, and an equally varied offering of products owing to the differing species, stocks and geographical origins of Fraser salmon. The Fraser River is the largest salmon producing watershed in British Columbia and host to one of the most diverse and productive salmon fisheries in the world. Located on the eastern shore of the Pacific Basin and mid-point in the hemisphere’s productive salmon region, Fraser salmon enjoy the relative high freshwater productivity of the continents Rocky Mountain Range with easy access to the richly productive northern Pacific gyre. Pre-contact salmon fishing on the Fraser River created entire societies. Wars were fought and economies were won and lost over the abundance. But, it was the fur trade that brought contact, and the North West Company and Hudson Bay company brought alternative forms of trade and commerce in fur then gold. However, it was a 1914 rockslide in the Fraser Canyon, triggered by construction of the Canadian National Railway to unify Canada, that brought international attention to the River. The debris created a velocity barrier that obstructed the passage of Pacific salmon. Salmon populations in the most productive regions of the upper Fraser were badly depleted (some never recovered) and the Federal Government imposed new fishing restrictions on natives. It was not until the International Pacific Salmon Commission was formed by Canada and US to address common interests in the fishery, that construction of fishways at Hells gate was undertaken and finally completed in 1944. Hells Gate is a world renowned tourist attraction, but ironically it was the Hells Gate disaster that changed the economy of the river forever and nearly destroyed the salmon fishery. for branding collaboration and certification in order to reflect the broad range of products and qualities that celebrates this river’s wild and diverse salmon fisheries. The presence of available TAC (Total Allowable Catch) for Fraser Select salmon fisheries is identified when and where the target harvest is available. Localized plans reflect where by-catch of non-target fish can be minimized and how to strategically target the abundant stocks. 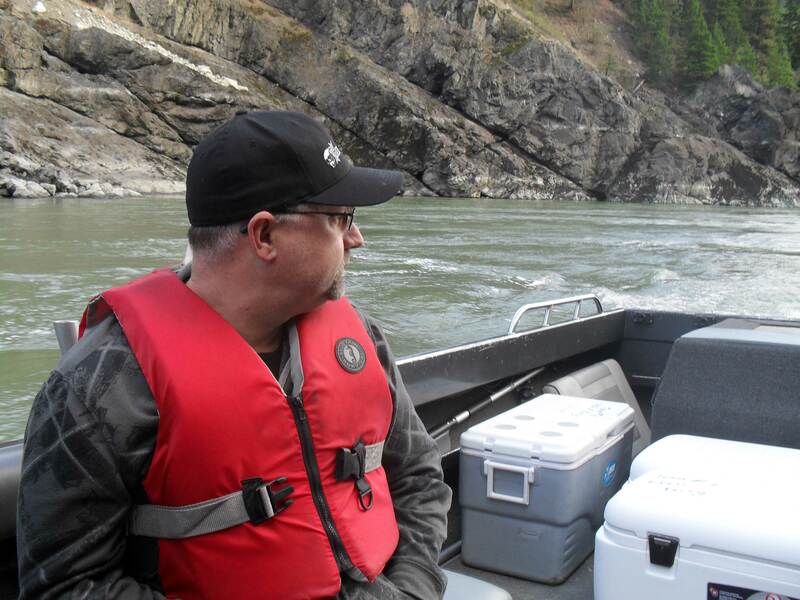 In-season stock assessment data to make these decisions in-river is improving, however these “small bite” fisheries must mobilize with short notice and often at a significant amount financial and environmental risk if not carefully managed. Therefor the fishery plan must be based in good stock assessment information, and that there is a system in place to ensure that the escapement, FSC and other fishing interests can be properly addressed both locally and around the watershed. Modern salmon fishery managers understand that they need to take into account the different productivities of each species and stock of Fraser salmon. Pink salmon are found as far upstream as Quesnel and considered part of one large Conservation Unit. Chum salmon, present only below the Fraser Canyon are represented by two distinct spawning populations, one near the Canyon and another is spread widely throughout the lower Fraser River and its tributaries. Chinook salmon exhibit a wide variety of sizes, flesh colors, timing and life histories. This makes them a challenge to manage, complicated even more by the high rate of interception along the west coast when they mix with fisheries targeting enhanced Columbia River chinook. The great diversity of Fraser River sockeye populations are generally represented by four management groups – early Stuart (the first to arrive in the Fraser River in July), Early Summer, Summer and Late Sockeye. Most of these are comprised of a dozen or more distinct local populations. Due to the complexity of Fraser salmon populations, the Canadian and US Governments spend $ millions every year to forecast returns and risk-manage marine approach fisheries. Inland salmon managers espouse a more precautionary approach, preferring to see at least half of the fishery to be harvested in-river where the strength and origin of the catch is known. The goal is to ensure that marine mixed stock fisheries, where the strong stocks cannot be differentiated from the weak, leave sufficient abundance untouched so that river fisheries behind them are able to ensure adequate escapements to each local population, while protecting local subsistence fisheries, and managing for an ecologically sustainable selective fishery on strong stocks. While fishing tools vary with water conditions and species, dip-net fishing is considered by many the fishing tool of choice. This traditional fishing technique is popular in the river canyons, and wherever they are seen to congregate they are considered a harbinger of the arriving salmon. The Coyote played an important role in the mythology of Fraser First Nations and the fate of the salmon fishery upon which they depended. Our artist was able to fuse the shadow of the dip-net fisherman with that of a coyote, depicting the coyote as a presence, always there with the fishers and the salmon. In a time beyond memory it is told that the Indians of the Fraser River became hungry, for the salmon did not return. So the spirit of Coyote was sent to bring the salmon back. He encountered and destroyed a giant weir blocking the river downstream, and led the salmon home to each of the many different spawning tributaries of the Fraser River. As he ascended the Fraser, the salmon followed him in great schools. He lit fires at each tributary as he progressed, beckoning the river natives to celebrate each returning stock. And, he reacquainted them with their distinctive ways to catch, prepare, and preserve each salmon run as their ancestors had done before them, so that their people and the salmon could survive and prosper. He asked for nothing, though he implored of the river natives to protect every one of the salmon runs, and to catch, eat and trade salmon as a celebration of their existence, but to always ensure enough escaped to spawn and feed those upstream. 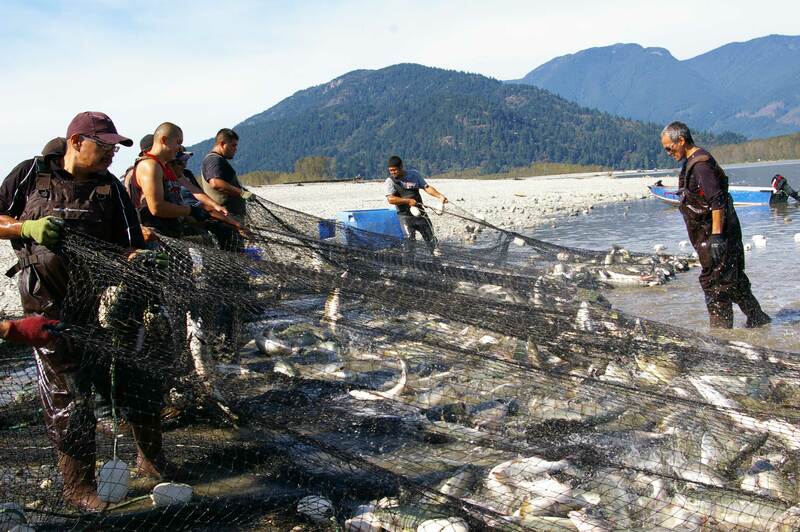 The endurance of ancient harvesting innovations in the Fraser River, often uniquely different between First Nations and salmon runs, are a testimony to ancient cultures and knowledge that have survived with these salmon for thousands of years. These rich cultures embody the holistic knowledge vital to the survival of tomorrow’s fishery, and the wisdom to protect these salmon for time immemorial. Finally, it was said that in a time too far ahead to see, that the Fraser salmon runs would dwindle once more, and the Coyote would return once again to bring back the salmon. Perhaps then, the distinctive customs, innovations and knowledge will still endure as a reminder of the places the Fraser salmon call home.